I spent some time in June in the Outer Hebrides, visiting places I haven’t seen before. These islands are very windswept and almost treeless. They have spectacular coastlines with miles of golden and white sandy beaches. In summer the machair (dunes) is covered with wild flowers. Much of the land is boggy and full of small lakes, with flat areas to the west and high mountains to the east. There is a string of islands, many of which are now joined by road bridges. We visited most of the bigger ones, all of which had houses grouped in all kinds of inhospitable-looking places, with schools and churches and shops. Some of the islands, like South Uist and Eriskay, are distinctively Catholic with wayside shrines and statues of Our Lady of the Isles. Some follow one or more of the Protestant traditions, like the little island of Scalpay which has two free churches within a stone’s throw of each other. There are many Gaelic speakers still, but a lot of English settlers too. Peat is still cut as a fuel, but there is also wind power now. At first glance there wasn’t much wildlife, but close up there was plenty. We heard the cuckoo several times, which is always a pleasure, and saw it crossing between some rare trees outside a settlement. On South Uist we also saw an eagle swoop down and take a young lapwing. Sea birds were abundant. On Scalpay especially we saw gannets diving, and terns flitting like swallows. It was nice to see some greylag geese, not just Canada geese! There were mammals too, seals and otters. 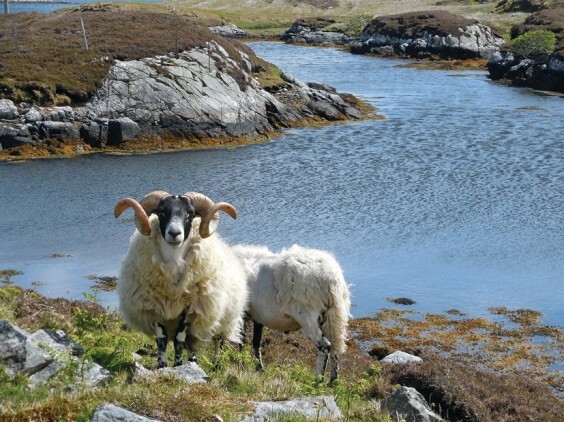 Of course there were sheep everywhere, and there is still a weaving tradition especially on Harris. Free roaming sheep and deer are one cause of the lack of trees. We were told about a man who has planted a native wood near one of the estuaries, and it has thrived behind a very strong fence. The flowers in June were still spring flowers: everything there is later than here anyway, and especially late this cold year. So we saw places covered with bluebells, and others with primroses or marsh-marigolds. There were lots of interesting bog flowers, including the bogbean, which is more beautiful than it sounds, and the striking blue butterwort, an insect-eating plant. On the machair on Eriskay the flowers were just beginning to come but were not yet in their summer glory. The dunes were studded blue with tiny milkworts and scyllas. These dunes are grazed not only by sheep but by small local wild ponies. On the rocks were clumps of thrift, and the far less common moss campion. Many rocks were covered in juniper, a native evergreen becoming rarer in England. One thing that grows commonly on the islands is lady’s mantle (alchemilla) which we know mostly as a garden plant. Lady’s mantle appears in several forms. It was a much-used herb and its Latin name means “the little alchemist”. The common name refers to Our Lady and shows how much it was revered. Even the drops of water that gather on its leaves were thought to have curative properties. Coming home was, as always, a pleasure. Here, of course, summer was well under way. I was glad to see that the banks of the canal towpath were full of yellow flag irises. These had been churned up and buried by the relaying of the towpath, but have come back a treat. In fact, most things have come back well, with the meadowsweet, marsh woundwort and greater willowherb following on. I was even more delighted when I found that the bee orchids have come back. If you are a long-term reader of The Village, you may remember that I wrote about them in one of my early articles. They grow on a patch near the canal, and were there regularly for three years. Then the contractors changed, the patch was heavily mowed in summer for five years running and they disappeared. But they hadn’t gone! All that time they were working away underground, and maybe seeds were germinating too. This year the patch was mowed in April or May and the vegetation came late, along with the orchids. They were probably due to be mown down again when I found them (thanks to a neighbour!) and I got the ecologist from the Canal and Rivers Trust out to see them. He has promised to alter the mowing regimen for that patch. The best thing is that there were more of them – we counted 18 flower spikes. They are quite well hidden in the grass and people were walking past without seeing them. I’m not going to publish the location, and anyway they’ll be over by the time you read this, but if anyone wants to look for them next year I’ll happily show you where. Orchids are funny things. They pop up really suddenly from their underground growth, and sometimes come and go without apparent reason. Underground they have complex systems and can’t be easily transplanted as they need all the micro-organisms that surround them. (You can do it by moving a big piece of turf with them). Seeds can take a long time to establish before the flower spikes pop up. It seems to have been an especially good year for them everywhere. The canal bee orchids were put in the shade by some others I saw in a patch of private ground in the Village area. Here there are dozens of them, along with common spotted orchids and lots of other interesting wildflowers. It is a place with a funny mixture of soil, not very fertile, and ideal for these plants. The owner has mowed parts of it to different heights and left other parts to grow, which gives a perfect environment for wild flowers. I saw an unusual vetch called grass vetchling, a little red pea-flower that grows from grassy leaves and stems. I was surprised to find viper’s bugloss there. This tall handsome blue plant usually grows on dry grassy places by the sea, yet here it was about as far from the sea as possible. Of course, this isn’t the only seaside oddity we have here. We have a lovely plant of alexanders near the canal. And the wild carrot near Alvechurch station has just reappeared after its demolition last year. Plants like these are brought in on soil or stone and often grown near transport routes or spoil tips. Talking of the station, I have continued to be amused by the so-called “wild flowers” that have been sown on the new banks. The most spectacular were the oriental poppies, one of which has also been introduced on the old bank. They have also popped up along the renewed towpath. There are some good wildflowers too, like weld, an old dye plant, and camomile. I don’t really mind these funny mixtures of wild and cultivated flowers, which you usually get in country areas on the edge of village gardens. But I have doubts whether many of the flowers will survive well. Even the native ones are plants of disturbed ground which may disappear. The old bank by the original platform is lovely, though. It has been left to grow naturally and has come back to being a proper little meadow again. It had a lovely show of moon daisies this year, and the wild strawberries fruited. Among the other flowers was St John’s wort, the flower of midsummer (rather late this year), and wild carrot. There was a lovely background of birds’ foot trefoil. I was delighted to see that the council mowed Hopwood motorway roundabout differently this year, cutting a few patches for visibility and letting the moon daisies bloom. Meanwhile some of the fields around Withybed are turning into proper meadows. They received a donation of hay from Eades, and are now full of hay-rattle. This plant is parasitic on grass and will gradually allow other flowering plants to take over more. There may be other seeds dormant, like orchids. The fields are already full of sweet-smelling flowers, and butterflies in the sun. August sees two festivals in the old calendars. One is Lammas, the old Celtic harvest celebration of Lughnasadh, which comes halfway between solstice and equinox like other Celtic festivals (Imbolc, Beltane and Samhain). It was Christianised as the “loaf- mass” where special bread was made from the first grains harvested, and blessed. The second is St Lawrence or Laurence, whose day is on August 10 – the saint of Alvechurch church. He was a 3rd century bishop who was ordered to surrender his church’s treasure to the Roman authorities. Instead he gave everything to the poor, and presented the poor and sick to the authorities as the “treasures of the church”. For this he was put to death. So August has echoes of plenty and poverty, issues still relevant today. We have a new family of geese here, and I noticed how quickly the goslings got their adult colours in June (unlike swans which keep their brown plumage for a year or more). Someone has seen a family of swans with six cygnets, though they haven’t settled near me this year. The moorhens are doing their usual precarious nest building, with one stuck out in a branch in the middle of the canal. There is also a young mandarin duck. I can’t tell if it is a pure bred one (in which case there is a female around as well as our amazing drake) or a mallard cross. We’ll have to see how it grows up. Under a bridge nearby, I had seen a lot of swallows swooping. I had a good look and sure enough there was the nest, with the parents sitting and some little ones chirping. And the CRT ecologist showed me evidence of otters on the canal, which surprised and pleased me. What a lovely place to live. This is one of the poems I wrote after my recent visit. In the absence of trees to sway. Familiar to the folk who live here. Every sheep a memory of warmth. Sweeping over the bleak moor. Yellow, pink, blue, painting the land. They call them lazy beds. Stretching out hands to hold the land together.